I chose this image and my favorite app ArtStudio. While I use this app regularly, I feel I’ve only scratched the surface of its robust capabilities. After importing the image, I distorted the image as shown. Using the eraser tool I removed the background and used the smudge tool to create a quick painterly look on the entire image. To create movement and emphasis I smudged some areas more than others. I used the airbrush tool and painted a very loose background that even covers parts of the figure. Then I smudged a little more. I then duplicated the layer, and further distorted this layer using the elastify filter. This filter is a lot of fun to use, and appears in my work frequently. Here, I adjusted the color using the blending mode Burn. 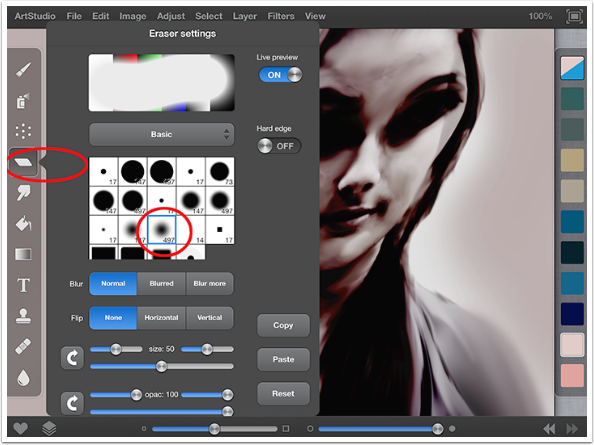 For those of you familiar with Image Blender, ArtStudio has the same blending modes and a couple more but you have more control for soft masking here. Next, I used the eraser tool with a very large and soft edge to selectively remove areas. 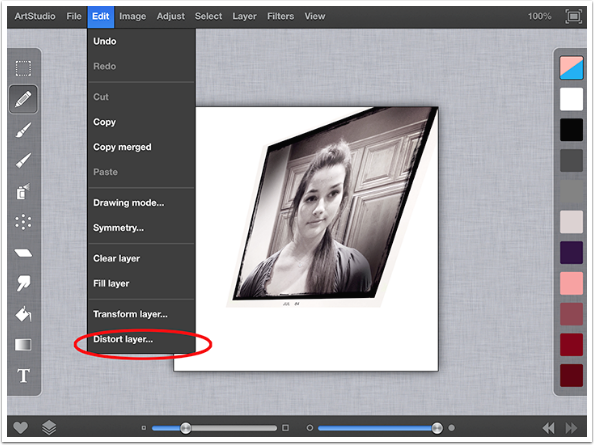 My one complaint about this app is the limited number of layers on an image of any size. This image is 2448 x 2448 and is therefore only capable of 6 layers at any time. 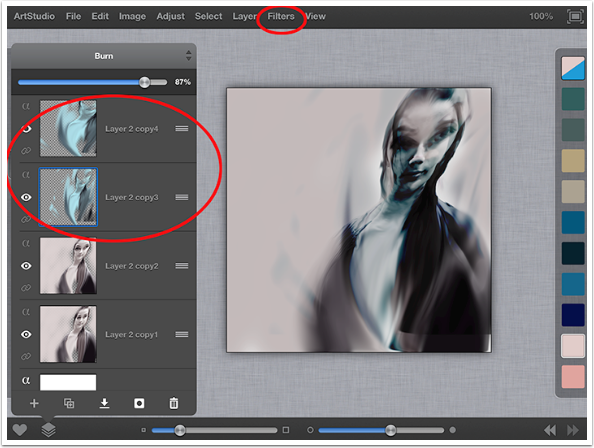 I would keep my layers much longer but because of this limitation, I am forced to merge layers more frequently. Here, I merged the top three layers. 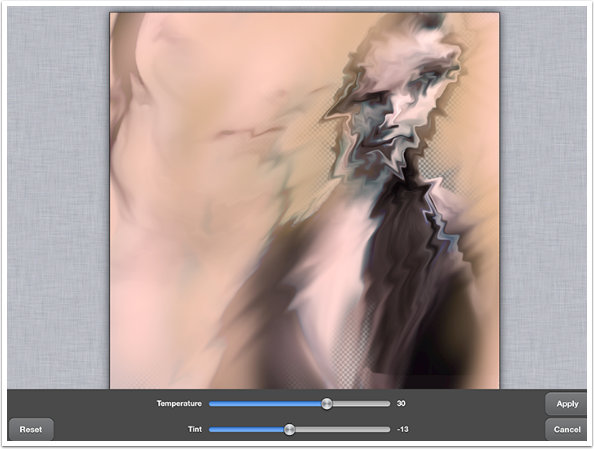 Next, I duplicated the result of the merged layers and adjusted the opacity for this layer to 80%. I used the transform function to offset the two layers. 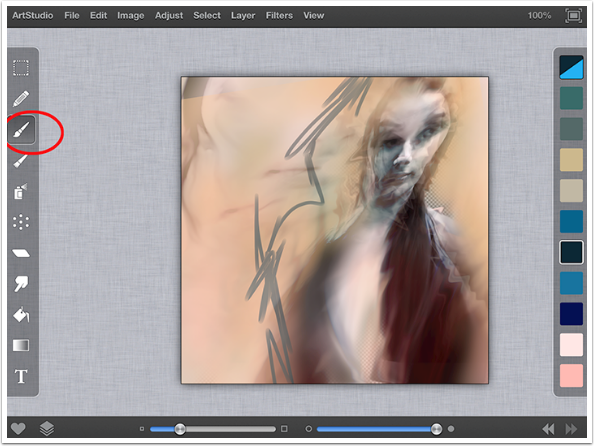 Then I merged the two layers, and duplicated that resulting image. Here, I adjusted the temperature and tint to some rich blue tones. I duplicated the blue layer and used the elastify filter on both of the blue layers. 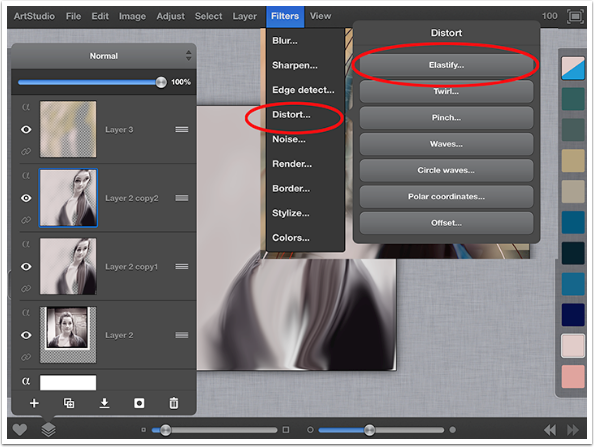 You can name your layers in ArtStudio, but I rarely do because I merge them so frequently. 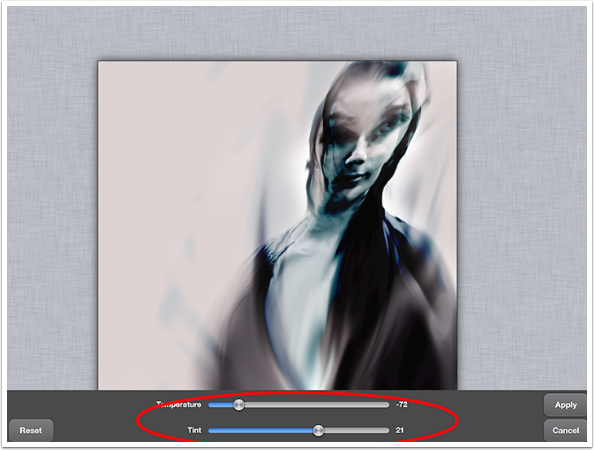 Adjust the opacity levels on each of these layers until satisfied. Merge them together. I merged down the top three layers. Next, I duplicated the layer and used the elastify tool to distort. I adjusted the color using temperature and tint. Erased selectively, and adjusted temperature and tint again to intensify color on that layer. On the blank layer, I used a paintbrush to add color where desired. This is where it gets really fun for me as I begin more of the drawing and painting part of the piece. I usually move very quickly between layers and tools and its very difficult for me to slow it down and document each step. I used a smudge tool to blend until I was happy. I repeated steps 10 and 11 several times until I was happy with the amount of color. I had each layer set to different opacities so all the layers could be seen at once. Additionally, I used different paintbrushes and colors to paint on layers above the main layer that way if I don’t like something; I haven’t ruined what I was already happy with. 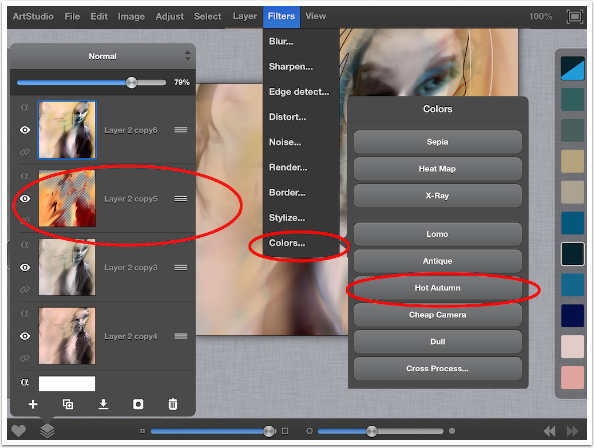 In the filters are several preset colors. One of my favorite presets adds intense, rich, warm tones called Hot Autumn. 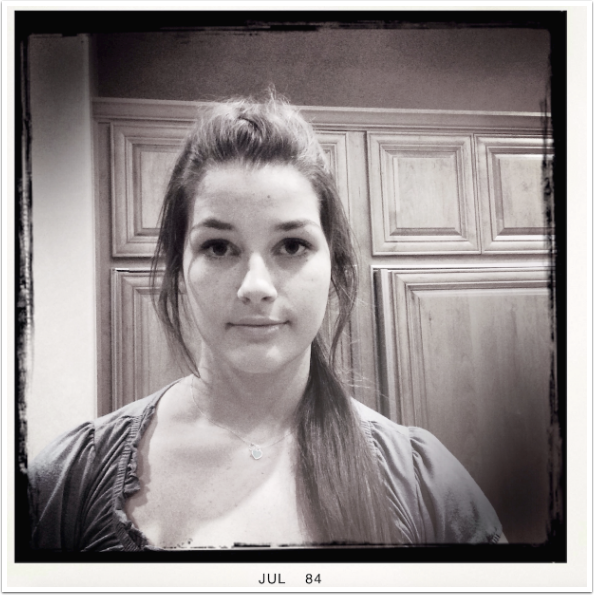 I have applied that filter to the second layer as shown. I selected a portion of the darker area and created a rectangle. Adjusted the colors using varied tools under the adjust tab until I was happy. Then I added noise under the filters tab. I placed it horizontally over the image. 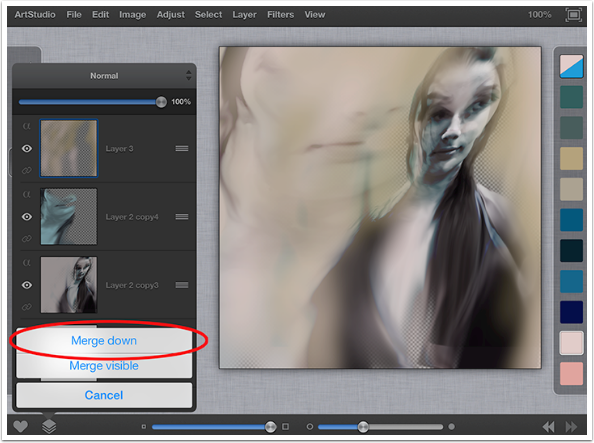 Next, erase to reveal the desired portions of the figure. At this point, I just draw and paint sometimes directly onto the main image, or on separate layers depending on the look I am after. 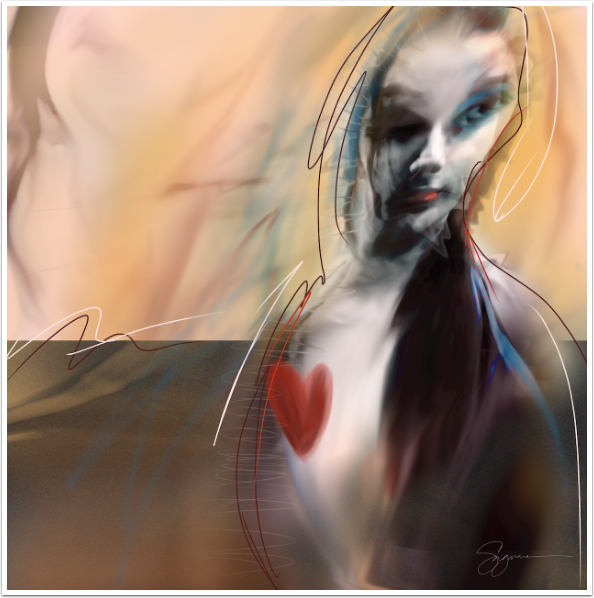 On this piece I used the pencil tool with a variety of different colors in a loose fashion to give a little movement to the piece. 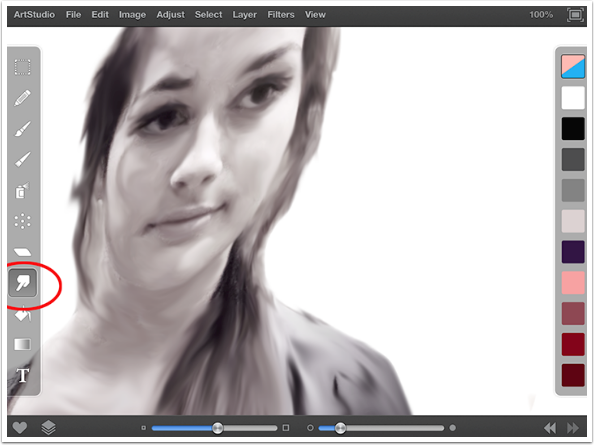 I also used the paintbrush tool to add the heart and some color on her lips. Quite the transformation of a image. Congratulations on your new position! I look forward to seeing some KILLER tutorials and workflows from you. 2) In reference to the above, number each step on the picture so those of us who are not so intuitive can follow and see (merge 9 & 10) or whatever step you are doing. 3) Request: Can you do a tutorial with Stackables so we can so how the pros create their formulas for blending textures and opacities?